We are big fans of RSS feeds for staying up on news coming from many sites. Some folks use just the an iPad app, others use a desktop solution like Google Reader then read via an app that presents that news only. For the Google Reader fan, we have found a solution that is working pretty well for displaying all the news feeds (RSS) you have chosen. The beauty of an app like this is that the news is available on the iPad and desktop so you don’t end up with a ton of news piling up on the iPad. A recent addition to the RSS news feed reader options is River of News. 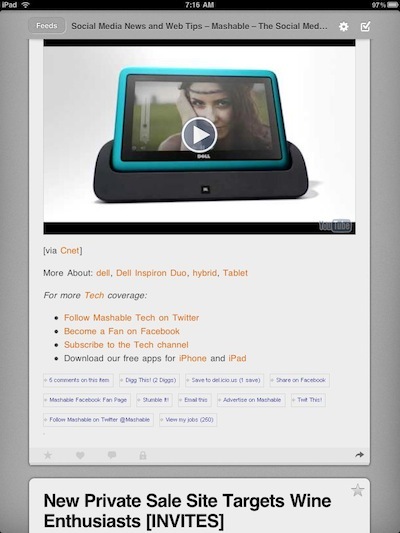 This iPad only solution gets the news you have chosen to recieve and presents it in a way that is easy to navigate. 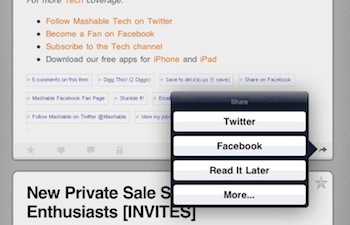 Many sharing options makes it a quick hit for the way we like to view news. First, understand that River of News does not allow you to add/remove the news providers. It is for accessing ones that you have already set up through Google Reader online. Asside from that, the app presents the news in a fashion that makes your feeds easy to read and quick to get through. Simple is key with River of News. 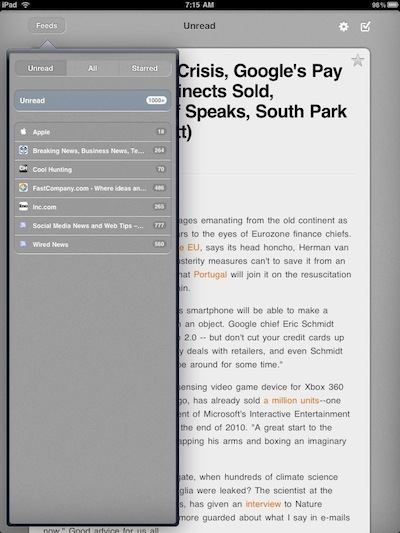 The Feeds button results in access to your individual feeds, overall unread, all and articles that you have ‘Starred’. Choosing any of these options results in a full screen, scrollable filtered list of news items. The resulting list of articles scroll up/down. Containing more than just headlines, news items can be full robust depending on the provider’s feeds. At the bottom of every article is the option to mark as Starred, Like, Share (a Google Reader function), and Keep Unread. If you change your mind, just tap the icon again to unset. Depending on your reading habits, the upper right corner of every filtered list has the ability to mark all of the list as ‘read’. Really nice if your a week behind in your reading and don’t want to have to pick through the ‘old’ news. The setting star icon at the top of River of News brings up several tuning options. 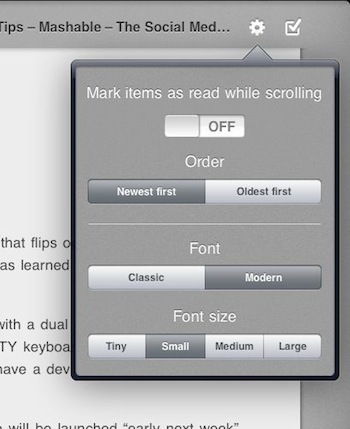 ‘Mark items as read while scrolling’ will do just that, marking anything you scroll past as ‘read’ will allow you to filter those out of your viewing later. Sorting order of oldest or newest at the top as well font adjustments are a nice add for this app to make it easier to get through your feeds. No surprise to anyone who reads this blog often, important to us for any news reader is the ability to quickly share with others what we just read. Not only fun, it is our way of making sure other team members or followers in our social network are fully ‘in the loop’. River of News offers a ‘share’ option on every article in the lower right corner. Tap to send via Twitter or Facebook. Also supported is sending to your Read It Later if that is your default location to read news later. As if the basic ‘share’ features where not enough, tapping ‘More…’ brings up a list many other options to get the news post out to others via email, social networks and blog posts.